Last week we looked at IT software productivity trends for 1000 completed IT systems and noted that average productivity has declined over the last 15 years. The post sparked some interesting responses. 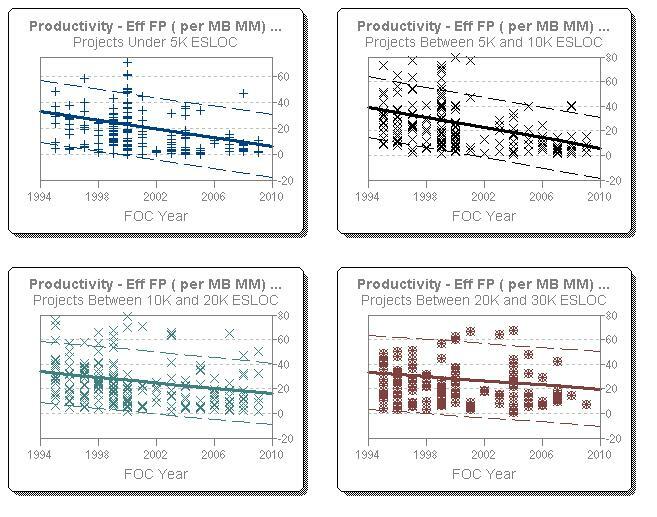 Two readers wanted to know whether productivity actually increases over time for projects in the same size range? If so, this would be an illustration of Simpson's Paradox: a counterintuitive phenomenon we've seen from time to time in our own research. Simply put, sometimes the direction of a trend is reversed when the sample is broken into categories. Recently I attended a seminar on a commercial reporting and data sharing product. In the sales material and discussion, the phrase “Single Version of the Truth” was used several times. But what does it mean? Sounds simple, doesn’t it? Sales pitches for svot imply that if distributed data sources were linked into a single master repository, the problem of unambiguous, consistent reporting and analysis would be solved. Yet reports are often based on different data using different definitions, different collection processes, and different reporting criteria. Regardless of which size measures (Effective SLOC, function points, objects, modules, etc.) your organization uses to measure software size, code counters provide a fast and easy way to measure developed functionality. If your organization uses Effective (new and modified) SLOC, the output from an automated code counter can generally be used "as is". If you use more abstract size measures (function points or requirements, for example), code counts can be used to calculated gearing factors such as average SLOC/FP or SLOC/requirement. The QSM Code Counters page has been updated and extended to include both updated version information and additional code counters. Though QSM neither endorses nor recommends the use of any particular code counting tool, we hope the code counter page will be a useful resource that supports both size estimation and the collection of historical data. Our recent webinar, "Introduction to the High Performance Benchmark Consortium," was a great success and we are already looking forward to planning our next presentation. Joe Madden received a lot of insightful questions regarding our new consulting program. We are aware that your time is valuable and scheduling can be a challenge, so we have recorded a replay, including Q&A, for anyone who was unable to attend the scheduled webinar. I am pleased to announce that on Thursday, February 25 at 1:00 PM EST, QSM will be hosting a webinar based on our new High Performance Benchmark Consortium. QSM has introduced a program specifically designed to help software development or acquisition organizations quantify and demonstrate performance improvement over time. The High Performance Benchmark Consortium is for clients who want to be best in class software producers and are willing to be active participants in the program. In today’s economic environment it is more important than ever for both suppliers and acquirers to compete more effectively and provide value to their customers. Members of the Consortium gain access to proprietary research that leverages the QSM historical benchmark database of over 8,000 validated software projects. To register for this event, simply follow this link and click "Register." QSM consultant Paul Below has posted some quick performance benchmarking tables for IT, engineering class, and real time software. 1. Application complexity is a big productivity driver. IT (Business) software solves relatively straightforward and well understood problems. As algorithmic complexity increases, average duration, effort, team size increase rapidly when compared to IT systems of the same size. 2. Small teams and small projects produce fewer defects. Projects over 100 effective (new and modified) source lines of code all averaged Mean Times to Defect of under one day. 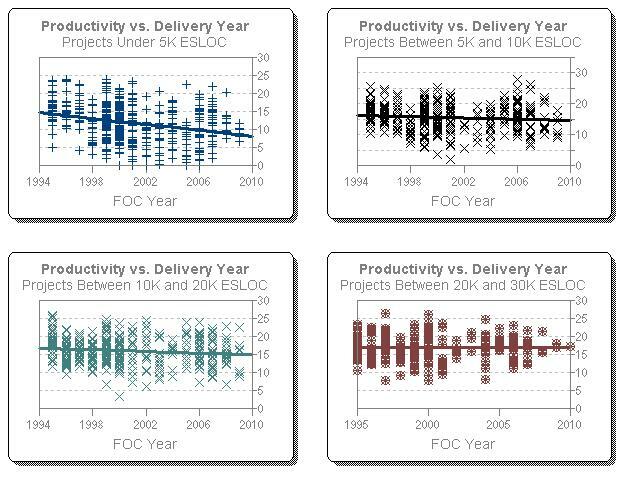 We see this over and over again in the QSM database: small projects with small teams consistently produce higher reliability at delivery.